The Audi Sport ABT team today (6, March) unveiled their new team livery at the Geneva Motor Show in Switzerland. Revealed on stage, the only German outfit pulled the covers off the fully electric Spark-Renault SRT_01E car to display their red and black livery. The new car will make its competitive debut at the opening round of the FIA Formula E Championship in Beijing on 13th September 2014. As well as the new colour scheme, the presentation confirmed ABT’s new partnership with German electronics company Telefunken. 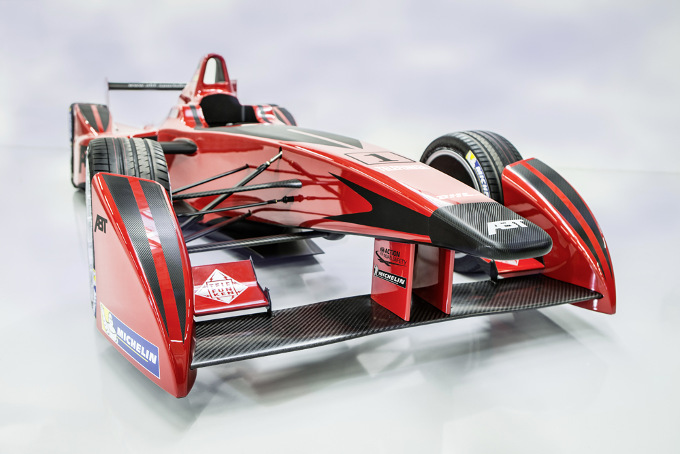 ABT Sportsline is one of 10 teams to have signed up to the new electric race series. The team based in Kempton, Germany, have a prestigious background in motorsport with five DTM titles to their name. They are one of the most successful German race teams with other notable victories in GT and endurance championships. The team will compete in association with Audi, continuing their commitment as a factory team in German touring cars. The new venture marks a return to the team’s early single-seater outings in the 1990’s with early success in Formel ADAC and Formula 3. ABT have recently announced their driver line-up for the coming season. Former F1 driver Lucas di Grassi will pair up with GP2 youngster Daniel Abt.